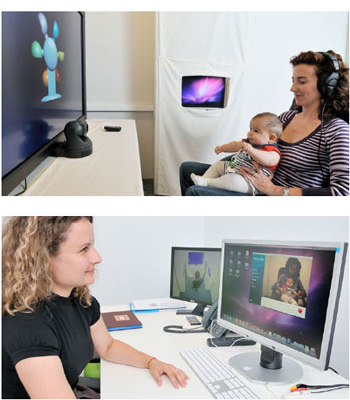 In our state-of-the-art infant lab, a number of methods and techniques are available to discover the first steps of human language development. The behavioral set-up supports the Visual Habituation,Head-turn Preference, and Intermodal Preferential Looking procedures to assess preverbal infants’ general language skills (from 3to 12 months of age), and to investigate older infants’ syntactic and lexical knowledge up to 28 months of age. The behavioral set-up is supplemented with an electrocardiogram(ECG) system that collects heart rate recordings of the infant during behavioral tasks. ECG activity reflects how infants’ attention is being modulated and regulated in the context of specific language experience. In addition to the methods at the behavioral and physiological levels, we are also equipped with EEG/ERP systems suitable for infants and children. Electrophysiological recordings are advantageous in infancy as they provide a direct and online measurement of processing abilities; moreover, the exact same technique can be applied through out the whole lifespan, making it possible to track language related developmental changes. Our EEG/ERP systems can be integrated with the ECG system as well. The BCBL babyLAB offers a cutting-edge research venue within an exceptional environment for investigating monolingual and bilingual language development comprehensively.